President Recep Tayyip Erdoğan has urged Muslims around the world to unite in the face of several regional crises and challenges. Speaking at the Organization of Islamic Cooperation (OIC) Science and Technology Summit in Astana Sunday, Erdoğan said Muslim countries should work together to end the suffering of Rohingya Muslims in Myanmar. In his address before the heads of states and representatives from predominantly Muslim countries, Erdoğan said: "We want to work together with the governments of Myanmar and Bangladesh to get ahead of the ongoing humanitarian crisis in the region. We have communicated our offer of aid to the Bangladeshi authorities and have expressed our expectations for the necessary facilitation to be provided to Muslims fleeing repression and murder." The president added that international organizations and Muslim countries, in particular, should work together to exhaust all possible means to end this cruelty. Earlier at a press conference Friday, Erdoğan revealed Turkey plans to build a tent camp in Bangladesh for Rohingya Muslims. "The tent camps are unlivable right now. If the Bangladesh government designates an area to us, we plan to build new tent camps there, while utilizing our experience," the president announced, adding that the first round of humanitarian aid from the state-run Turkish Cooperation and Coordination Agency (TİKA) has already been delivered and another round was on its way. He also touched upon the ongoing spat between the Gulf countries and the tensions in Jerusalem. "What the Muslim world needs now is not instability but unity and solidarity. The crisis in the Gulf region has upset us deeply. We want the crisis in the Gulf to be resolved as soon as possible. We can never allow for the violation of the holiness of Jerusalem and aram al-Sharif. We should adopt a more determined attitude to prevent further provocations," Erdoğan said. Saudi Arabia, the United Arab Emirates (UAE), Egypt and Bahrain cut diplomatic ties with Qatar and severed air, land and sea links with the country on June 5 after accusing it of supporting extremist groups. Qatar strongly denies the claims, arguing that efforts to isolate the country were politically motivated. President Erdoğan also pointed out that Muslim countries lose their "most successful children and brightest brains" to Western institutions and countries as a result of what he called "brain drain." "Today, 55 percent of the population in the Islamic world does not even know how to read or write. In the OECD countries, the percentage of nationals who are educated is 5.2 percent, compared to less than 1 percent in the Islamic world. We are not producers but rather consumers of information technology, which is the most important source of power in today's world. This makes us fragile in many respects, especially in terms of national security. I want to emphasize the fact that today, as it was yesterday, being a strong country is contingent on producing knowledge and processing it in the best possible way," he said. He also emphasized that the leaders of Muslim countries should allow their citizens to gain access to all of the benefits the internet has to offer while protecting them from its dangers, particularly referring to the exploitation of the internet by terror organizations and anti-Islamic groups. 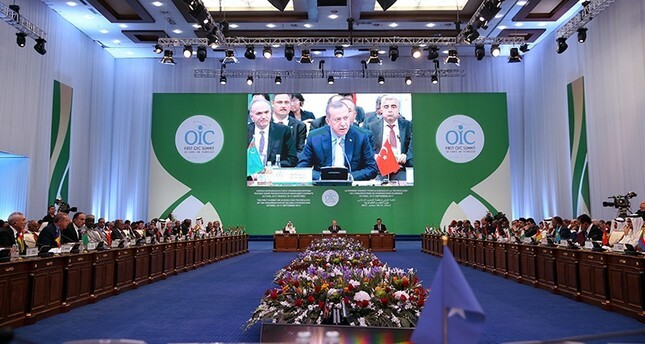 Meanwhile, President Erdoğan, who arrived in Astana Saturday morning on a two-day visit, held a number of bilateral meetings and attended the OIC Summit Sunday. He met with Iranian President Hassan Rouhani, Pakistan President Mamnoon Hussain, Bangladesh President Abdul Hamid, Venezuelan President Nicolas Maduro, Afghan President Ashraf Ghani and Bosnian member of the Presidency of Bosnia and Herzegovina Bakir Izetbegovic in Astana on the sidelines, to discuss regional developments and bilateral ties. He also met with Kazakh President Nursultan Nazarbayev Saturday. After the meeting, President Erdoğan said that preliminary work on the upcoming Astana summit, which will be held on Sept. 14, has been completed, adding that the steps taken toward establishing peace in Syria will hopefully be finalized in Astana. He also asserted that Turkey and Kazakhstan should work together to boost bilateral trade ties. Two close partners, Turkey and Kazakhstan established a strategic partnership in 2009, which became a corporate mechanism known as the Turkey-Kazakhstan High-Level Strategic Cooperation Council in 2012.